The British & Irish Lions is a rugby union team selected from players eligible for any of the Home Nations – the national teams of England, Scotland, Wales and Ireland. The Lions are a Test side and generally select international players, but they can pick uncapped players available to any one of the four unions. The team currently tours every four years, with these rotating among Australia, New Zealand and South Africa. The most recent series, the 2017 series against New Zealand, was drawn 1-1. Wilkinson was an integral member of the 2003 Rugby World Cup-winning England squad, scoring the winning drop goal in the last minute of extra time against Australia in the 2003 Rugby World Cup Final. He then came back from several injuries to lead England to the final of the 2007 World Cup. He played his club rugby union for Toulon following twelve seasons in the English Premiership with the Newcastle Falcons. Wilkinson has also toured twice with the British and Irish Lions, in 2001 to Australia and 2005 to New Zealand, scoring 47 Test points in the tour matches in which he has started (he also scored 20 points in the pre-tour test match against Argentina in Wales). A drop kick is a type of kick in various codes of football. It involves a player dropping the ball and then kicking it when it bounces off the ground. The 2003 Rugby World Cup Final was the final match in the 2003 Rugby World Cup, the fifth Rugby World Cup. The match was played between England and Australia on 22 November 2003 at Telstra Stadium in Sydney in front of a crowd of 82,957. The 2007 Rugby World Cup was the sixth Rugby World Cup, a quadrennial international rugby union competition inaugurated in 1987. Twenty nations competed for the Webb Ellis Cup in the tournament, which was hosted by France from 7 September to 20 October. France won the hosting rights in 2003, beating a bid from England. The competition consisted of 48 matches over 44 days; 42 matches were played in ten cities throughout France, as well as four in Cardiff, Wales, and two in Edinburgh, Scotland. On 3 April 2009 at Guildford Cathedral, Wilkinson was awarded an honorary doctorate by the University of Surrey for services to the sports industry. Wilkinson announced his retirement from the English national squad in early December 2011. He retired from all rugby after the end of the 2013–14 season. On 17 November 2016, he was inducted into the World Rugby Hall of Fame at the opening ceremony for the Hall's first physical location in Rugby, Warwickshire. Wilkinson is currently a studio pundit for ITV Sport, working on their coverage of the Six Nations Championship, Rugby World Cup and other major rugby events. The University of Surrey is a public research university in Guildford, Surrey, United Kingdom. The university is interdisciplinary, with a science and engineering heritage. It received its charter on 9 September 1966, and was for more than 60 year prior near Battersea Park in south-west London. The institution was known as Battersea College of Technology before gaining university status. Its roots, however, go back to the Battersea Polytechnic Institute, founded in 1891 to provide further and higher education for London's poorer inhabitants. More recently, the university launched the Surrey International Institute with Dongbei University of Finance and Economics. Frimley Park Hospital is a large, 938-bed general hospital in Frimley, Surrey. It is managed by Frimley Health NHS Foundation Trust, and houses a private wing. Alan Victor Tait is a Scottish dual-code rugby footballer, and coach. He was until January 2012, head coach at Newcastle Falcons and a former rugby league and rugby union footballer who played outside centre for Scotland, and the British and Irish Lions. He played club rugby union for Kelso, and the Newcastle Falcons, and club rugby league for Widnes and Leeds. Michael John Catt OBE is a South African-born former English rugby union rugby player who played for London Irish and Bath. He earned 75 international caps for England and played in two World Cup Finals, in 2003 and 2007. With his appearance in the October 2007 final, at age 36 years 1 month, he became the oldest ever player to play in a Rugby World Cup final. He then participated in England's "Tour of Hell" in June 1998 that saw them suffer heavy defeats to both New Zealand and Australia (who defeated them 76–0). Wilkinson returned to domestic duties by taking over from Rob Andrew, who was made Falcons head coach (later Director of Rugby), as both their fly-half and goal kicker. Wilkinson became a fixture in the England team, and started in all their matches in the 1999 Five Nations Championship. He played for the Falcons in their 1999 Tetley's Bitter Cup final defeat to the London Wasps. The 1998 England rugby union tour of Australasia and South Africa was a series of matches played in June and July 1998 by England national rugby union team. The following year Wilkinson played in all five of England's 2000 Six Nations Championship matches. England won the championship, however they missed a Grand Slam after losing their final match against Scotland. Wilkinson then toured South Africa with England in June 2000, kicking all of the points in their 27–22 win in Bloemfontein. He was then capped another three times for England during the end of year internationals. In 2001, England again won the Six Nations Championship. After the opening win over Wales, Wilkinson set an individual Six Nations Championship points scoring record with 35 points against Italy at Twickenham on 17 February, to overtake the record of his Newcastle Falcons mentor, Rob Andrew. England won all their subsequent matches during the tournament, with the exception of the Irish match, which was postponed until October. More success followed for Wilkinson after the Six Nations, as the Falcons won the Powergen Cup: a late Newcastle try saw them defeat Harlequins by three points, by 30–27. As a result of Neil Jenkins suffering a number of injuries and a dip in form, Wilkinson was picked as the first choice fly-half and goal kicker for the 2001 British Lions tour to Australia in July. The Lions won the first test over Australia by 29–13 in Brisbane, in which Wilkinson scored nine points through his kicking. The second test, on 7 July, saw the Lions lose 35–14 at the Docklands Stadium. Wilkinson was blamed by many for throwing a long pass inside his 22 that was intercepted by Joe Roff: this was seen as the turning point in the match, and probably the test series. During the match, Wilkinson injured his leg and was stretchered off the pitch. The injury was thought to be particularly serious, but he made a full recovery before the Third and final test on 14 July. Wilkinson's try at the start of the second half ensured that, along with his kicking scores, he equalled the Lions' best individual scoring total in a Test, with 18 points. The incomplete 2001 Six Nations Championship was concluded in October, with England playing Ireland. England lost 20–14 at Lansdowne Road. Both Ireland and England had won four out of the five Six Nations fixtures, but England's superior points difference ensured they clinched the title although, for the second year running, not the Grand Slam. In a match against Australia for the Cook Cup in November, Wilkinson scored all of England's points in their 21–15 victory at Twickenham. After being rested as an unused bench replacement in the subsequent match against Romania, he then played a large role in a win over the Springboks, in which he kicked seven penalty goals in the 29–9 victory. Going for a third Six Nations title in a row, England got off to a good start in their 2002 Six Nations Championship with wins over Scotland and Ireland, before losing to France at the Stade de France. England won their remaining fixtures against Wales and Italy but France went on to complete a Grand Slam. The Falcons were in Pool 6 in the 2001–02 Heineken Cup, and won one match, finishing fourth in the pool. The opening match of the 2003 Six Nations Championship saw France, the reigning champions and Grand Slam winners, play England. Both teams were high in confidence, following successes in their end of year tests against nations from the Southern hemisphere. Many saw this game as the tournament decider and England won the match 25–17. Now considered favourites to win the tournament, as well as a Grand Slam, England defeated Wales, Italy and Scotland. For the game against Italy, Wilkinson was chosen as the captain of the squad for the first time in his England career, as Martin Johnson was unavailable due to the birth of his first child. The final match was against Ireland at Lansdowne Road and would determine the tournament, and Grand Slam winner of 2003. By winning 42–6, England became the 2003 champions and serious contenders for the upcoming 2003 Rugby World Cup in Australia. Wilkinson was named Man of the Match. England's first match at the 2003 World Cup was at Subiaco Oval in Perth, where they defeated Georgia 84–6, with Wilkinson scoring 16 points from his goal kicking. He played a major role in the pool match against the Springboks, in which he scored 20 of England's 25 points, in the victory which held their opponents to just six. The subsequent match against Samoa in Melbourne was surprisingly close for the number-one-ranked rugby nation against a supposed "minnow" of international competition, but England pulled off a 35–22 win. Wilkinson was rested for England's final win against Uruguay. England finished at the top of Pool D, four points ahead of South Africa. England moved into the quarter finals, where they met Wales at Suncorp Stadium in Brisbane. Aided by the arrival of Catt at half-time,  Wilkinson went on to score 23 points in the match, which England won 28–17 to proceed to the semi-finals. England met France, whom they had beaten earlier that year on two occasions. England won 24–7, with Wilkinson scoring all of England's points through his kicking. In the final versus Australia, with the scores level at 17–17, Wilkinson received a pass and kicked a drop goal in extra time with just 26 seconds remaining; England won 20–17. The last time Australia had lost a World Cup match was eight years earlier in the 1995 Rugby World Cup, when Wilkinson's mentor Rob Andrew scored a drop goal at the stroke of full-time to win the game for England. After the match, Wilkinson expressed his relief at converting the winning drop goal, as it was his first success in four attempts during the match. The win gave England its first Rugby World Cup, and broke the Southern Hemisphere's dominance of the tournament. Wilkinson became the tournament's leading points scorer with 113 points. He was voted the BBC Sports Personality of the Year and also named the 2003 IRB International Player of the Year. Within a couple of weeks of winning the World Cup, Wilkinson was found to have had a broken facet in his shoulder and missed the 2004 Six Nations Championship and the disastrous tour of New Zealand and Australia. He was named captain of the England team on 4 October 2004, replacing Lawrence Dallaglio, who had resigned five weeks earlier. However, he was kept out of the 2004 autumn internationals by a haematoma in his upper right arm, the captaincy being taken over by Jason Robinson and then Martin Corry. In January 2005, he injured his medial knee ligament in a match against Perpignan. He missed the opening matches of the 2005 Six Nations Championship and on his return to Newcastle on 13 March 2005 he injured the same knee again. In almost 18 months, he had played a total of only 937.5 minutes of competitive rugby union, but was nonetheless given a chance to prove his fitness for the 2005 British and Irish Lions tour to New Zealand. Initially Wilkinson was left out of the 44-strong squad which was announced by Clive Woodward on 11 April 2005. However, on 8 May Woodward announced he had added the fly-half to the squad after Wilkinson had proved he was injury-free and fit. Wilkinson made his first international appearance since the 2003 Rugby World Cup Final on 23 May at the Millennium Stadium in Cardiff as the Lions played Argentina. Wilkinson, along with the rest of the team, played poorly, but he kicked a conversion and six penalties and salvaged a 25–25 draw with the last kick of the game. Wilkinson's next international appearance was in the Lions' first Test against New Zealand, starting at inside centre instead of his normal fly-half position. Wilkinson scored the Lions' only points in their comprehensive 21–3 defeat. In the second Test, another heavy loss, he started in his normal role of number 10, but suffered a stinger injury, which ruled him out of the Third Test. Wilkinson was replaced by Stephen Jones in the final test. Wilkinson had to forgo participation in the Falcons' August pre-season games in Japan due to appendicitis. Then, after having appeared in five successive matches for Newcastle, the injury litany continued in late November with surgery for a sportsman's hernia, which he himself associated with the strain of his heavy training sessions, often involving two (or more) hour kicking-sessions. Rob Andrew, then Director of Rugby at Falcons (Andrew has since been appointed Director of Elite Rugby for the English Rugby Football Union), said that there was no chance of Wilkinson going on England's summer tour and that he would be taking the summer off. Despite missing two conversions, he demonstrated his playmaker skills in the game against the Worcester Warriors on 30 April, in which he played the whole second half. Afterwards, Andrew reiterated that Wilkinson should not tour during the summer to prolong his recovery period. Wilkinson started as captain in the Falcons last 2005-06 Guinness Premiership game of the season on Saturday, 6 May 2006, converting six of his team's eight tries in their 54–19 victory over Leeds Tykes. Rob Andrew stated in July, pre-season to the 2006-07 Guinness Premiership, that Wilkinson would be ready to challenge for an England position come the November internationals. Captaincy of the Falcons was also given to former Wallabies fullback Matthew Burke, a move that Andrew believed would allow Wilkinson to concentrate more on his game and a full return to rugby. In early August head coach of England, Andy Robinson announced the Elite Player Squad for the 2006–07 season, in which Wilkinson was included. In the 2007 Rugby World Cup Final, on 20 October at the Stade de France, South Africa won the Webb Ellis Cup in a game where Wilkinson slotted home 2 penalties, but missed 2 drop kick attempts. He was one of only four players to have started both the 2003 and 2007 Rugby World Cup Finals, the other three being Phil Vickery, Jason Robinson and Ben Kay. Going into the 2008 Six Nations Championship, Wilkinson was the obvious choice as England's number 10 and started the first four matches. Against Wales on 2 February 2008, Wilkinson scored 14 points, but England put in a poor display to fall 19–26 after squandering a 10-point lead at half-time. Wilkinson then amassed 27 points in England's next two wins against Italy and France. A disappointing loss against Scotland on 8 March, in which a number of the England squad put in poor performances, raised questions about Wilkinson's inclusion in the starting line-up given the emerging English talents at the number 10 position. 20-year-old Danny Cipriani was the main back up stand-off throughout the tournament (along with Charlie Hodgson), and replaced Wilkinson in the starting line-up for the last match of the tournament against Ireland. This was only the second time in his England career that Wilkinson was dropped to the bench (the first time being for the 1999 Rugby World Cup quarter final match with South Africa for which Paul Grayson was preferred). However, close to the start of the second half during the Ireland match on 15 March, Wilkinson was brought off the bench to replace Toby Flood, thus playing alongside Cipriani at inside centre. This suggests a possible synthesis to the balance of nurturing up-and-coming fly-halves while incorporating the leading player in the position in recent years into the squad. Despite competition over his position, Wilkinson ended the 2008 Six Nations as the tournament's top points scorer, compiling 50 points. He was not considered for Martin Johnson's first England squad (the 2008 summer tour of New Zealand) due to a shoulder injury. He was joined by Danny Cipriani on the sidelines after the Wasps player also missed out due to injury. On 1 July 2008, Wilkinson was named in Martin Johnson's Elite Player Squad and was the only specialist fly-half in the squad. The following week against Italy, he became the highest point-scorer in the history of the Five/Six Nations Championship (he has since been overtaken by Ronan O'Gara of Ireland). On 6 October 2007, he also became the highest point-scorer in the history of the Rugby World Cup, kicking four penalties to overtake Scotland's Gavin Hastings in a quarter-final against Australia. Wilkinson finished as the ERC European Player of the Year for the 2013 tournament, having not missed a single place kick in the knockouts with 17 from 17 attempts and finished with 56 points in the knockouts alone and 108 points in the entire tournament. 4 April 1998 5 Nations Twickenham Ireland (won 35–17) 0 Wilkinson makes his debut as a replacement for Mike Catt, becoming England's youngest ever player. 6 June 1998 Cook Cup Brisbane Australia (lost 0–76) 0 Wilkinson's first start is in England's biggest ever defeat. 13 October 2007 World Cup Saint-Denis France (won 14–9) 2 p, 1 d 9 Wilkinson again kicks France out of the World Cup in the Semi-final. Wilkinson wrote a column for The Times occasionally until 2011, often during periods of high media focus on rugby, such as Six Nations tournaments and Rugby World Cups. He has also written five books, which have been published by Headline. The first, Lions and Falcons: My Diary of a Remarkable Year, written with ghostwriter Neil Squires who also helped Wilkinson in a few other books, was released in 2001, and followed a turbulent rugby year for him. The diary documented the England rugby player's strike, the Newcastle Falcons winning the Powergen Cup, the 2001 Six Nations Championship and the British and Irish Lions tour at the end of the year. After helping England win the Rugby World Cup with his last-ditch effort in 2003, he released his second book in 2004. The book, My World, was largely picture-based, with less writing than in his previous publication. The writing that it did contain was focused on his experience of the 2003 World Cup, and how his life had altered following the winning drop goal. He was the 2003 International Rugby Board (IRB) International Player of the Year. Jeremy Clayton Guscott is an English former rugby union outside centre who played for Bath, England and the British and Irish Lions. He also appeared for England on the wing. In 2005, the British and Irish Lions rugby union team toured New Zealand for the first time since 1993, playing seven matches against first and second division teams from the National Provincial Championship, one match against the New Zealand Maori team, and three test matches against New Zealand. The Lions lost the test series 3-0, the first time in 22 years that they lost every test match on tour. Philip John Vickery MBE DL is a former English rugby union tighthead prop and member of the England squad. He was a member of England's World Cup winning squad in 2003, playing in all seven matches in the tournament, and is a former England captain. Vickery ended his club rugby career at London Wasps, joining the London side in 2006 after eleven years with Gloucester Rugby. Given the nickname "Raging Bull", he played in three Rugby World Cups, including as England captain in the 2007 tournament, and toured Australia and South Africa with the British and Irish Lions. Neil Jenkins, is a former rugby union player and current coach. He played fly-half, centre, or full back for Pontypridd, Cardiff, Celtic Warriors, Wales and the British and Irish Lions. Jenkins is Wales' highest ever points-scorer and is the third highest on the List of leading Rugby union Test point scorers. He was the first player to score 1,000 points in international matches. Christopher Robert "Rob" Andrew MBE, nicknamed "Squeaky", is a former English Rugby Union player and was, until April 2016, Professional Rugby Director at the RFU. He was formerly the Director of Rugby of Newcastle Falcons and has been Chief Executive of Sussex County Cricket Club since January 2017. Mathew James Murray Tait is a retired English rugby union player who gained 38 caps for England between 2005–2010, including starting in the 2007 Rugby World Cup Final; and played 279 club games for Newcastle Falcons, Sale Sharks and Leicester Tigers between 2004 and 2018. He was considered a utility back regularly playing at centre, fullback or wing. Tait made his Newcastle debut in 2004 and made his England debut at 18 years old in 2005, at the time the second youngest England player selected since the second World War. He played 87 times for Newcastle before joining Sale in 2008 where he played 49 times. Tait joined Leicester in 2011 and made 143 appearances between his 2011 debut and retirement. Whilst at Leicester Tait started the 2013 Premiership Rugby Final which Leicester won as well as the 2017 Anglo-Welsh Cup Final, which Leicester also won. His final game was on 5 May 2018 against former club Sale. Charles Christopher Hodgson is a retired English rugby union player, having previously been a player for Sale Sharks and Saracens. His position was fly-half and he is the leading Premiership points scorer of all time. Hodgson also played for England, until announcing his international retirement in 2012. Hodgson made 18 consecutive starts at fly half for England between 2004 and 2006. Iain Robert Balshaw, MBE is an English former rugby union player who played on the wing or at full back for Bath, Leeds Carnegie, Gloucester and Biarritz Olympique. He won 35 international caps for England between 2000 and 2008, and 3 for the British and Irish Lions in 2001. He was a member of the England squad that won the 2003 Rugby World Cup. Stephen Michael Jones is a Welsh former rugby union player who played primarily at fly-half for Wales and the British and Irish Lions. Frédéric Michalak is a French rugby union footballer, who currently plays for the Lyon OU in the Top 14. His early career was spent playing for his hometown team, Toulouse, in the Top 14 and in the Heineken Cup. He moved to South Africa to play for the Sharks in the Super 14 after the 2007 Rugby World Cup, but after just one year with the Sharks he moved back to Toulouse. He has also played over 70 tests for France to date, and is the country's leading Test point scorer, achieving that milestone in 2015. Michalak originally played scrum-half but has played mainly at fly-half. He has appeared in advertisements for companies such as Nike and Levis. Thomas John Bowe is an Irish former rugby union player from County Monaghan, Ireland. He played on the wing for Ulster, Ireland and the British and Irish Lions. In March 2012, after four years with Ospreys in Swansea, Wales, Bowe returned to Ulster for the 2012/13 season. Adam Rhys Jones is a Welsh former professional rugby union player. Tobias Gerald Albert Cecil Lieven Flood is an English rugby union player. He currently plays at fly half or inside centre for Newcastle Falcons having previously played for Toulouse and Leicester Tigers. He has also played 60 international matches for England. Simon Hodgkinson is a former England international rugby union player. He represented England at fullback between 1988 and 1991, gaining 14 Test caps. Tom Croft is a retired rugby union player. He played 173 games for Leicester Tigers between 2005–17 winning four Premiership Rugby titles, played 40 times for England between 2008–2015, was part of the squad for the 2011 Rugby World Cup, and was a tourist with the British and Irish Lions in 2009 to South Africa and 2013 to Australia. Stephen Leigh Halfpenny is a Wales and British and Irish Lions international rugby union player. Halfpenny is the third highest record points scorer for Wales after Neil Jenkins and Stephen Jones. He currently plays club rugby for Welsh club Scarlets who play in the Pro14. Owen Andrew Farrell is an English professional rugby union player, currently playing for Premiership Rugby side Saracens. Farrell has played international rugby for England since 2012, has previously played for the British and Irish Lions and has been the Captain of England since 2018. He is considered by many to be one of the best currently-active rugby union players in the world, having been nominated for World Rugby Player of the Year in 2012, 2016 and 2017. Sam Kennedy-Warburton, OBE MStJ, commonly known as Sam Warburton, is a Welsh former international rugby union player. Warburton played rugby for the Cardiff Blues and was first capped for Wales in 2009. He usually played as an openside flanker but was also capable of playing at blindside. In June 2011, he was named as Wales captain versus the Barbarians and subsequently in August 2011 he was named as the Wales captain for the 2011 Rugby World Cup. In April 2013, he was named the Lions' captain for the 2013 tour to Australia, and was also named as captain for the 2017 tour to New Zealand Warburton holds the record for the most Wales caps as captain. 1 2 "RFU England Player Profile, Jonny Wilkinson". Rugby Football Union. Archived from the original on 26 August 2011. Retrieved 23 August 2011. ↑ "Jonny Wilkinson". ESPN Scrum. Retrieved 14 August 2013. ↑ "Jonny Wilkinson MBE". UK: BBC News. 31 December 2002. Retrieved 20 May 2007. ↑ "University of Surrey awards honorary doctorate to Jonny Wilkinson". surrey.ac.uk. Archived from the original on 10 April 2009. Retrieved 4 June 2009. 1 2 3 4 5 "Jonny Wilkinson retires from England duty". BBC News. 12 December 2011. Retrieved 12 December 2011. ↑ "England World Cup winner to retire". BBC Sport. 19 May 2014. Retrieved 21 May 2014. 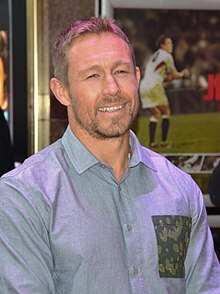 ↑ "World Rugby Hall of Fame: Jonny Wilkinson attends launch". BBC News Coventry & Warwickshire. 17 November 2016. Retrieved 6 October 2017. ↑ "Old Haunts". Jonny Wilkinson. Archived from the original on 7 November 2014. Retrieved 7 November 2014. ↑ "Jonny Wilkinson: 17 years of breaking rugby records". ITV. 19 May 2014. Retrieved 26 November 2015. ↑ "Jonny Wilkinson". adidas.com. Archived from the original on 26 April 2006. Retrieved 17 May 2006. ↑ "Jonny Wilkinson". newcastle-falcons.co.uk. Archived from the original on 28 September 2006. Retrieved 17 May 2006. ↑ Kitson, Robert (23 October 1999). "Grayson thrust into crunch position". The Guardian. London. Retrieved 20 May 2007. ↑ Kitson, Robert (25 October 1999). "Damning evidence may spell the end of England coach's reign". The Guardian. UK. Retrieved 20 May 2007. ↑ "Wilkinson revels in good fortune". UK: BBC News. 12 November 2002. Retrieved 20 May 2007. ↑ "Jannes Labuschagne breaks Wilkinson". YouTube. Retrieved 18 May 2013. ↑ "Woodward irate about 'brutal' Boks". UK: BBC News. 23 November 2002. Retrieved 5 September 2006. ↑ "England RWC team guide". BBC. 3 September 2007. Retrieved 5 February 2011. ↑ "Jonny Wilkinson did not need bailing out during 2003 Rugby World Cup final says former team-mate Mike Catt" . Retrieved 2016-07-11. ↑ "Jonny Wilkinson: 17 years of breaking rugby records". ITV News Tyne Tees. 19 May 2014. Retrieved 28 December 2014. ↑ "A new day dawns for Wilkinson". planet-rugby.com. Archived from the original on 7 July 2006. Retrieved 5 July 2006. ↑ Evans, Ieuan (3 February 2007). "Perfect script unfolds for comeback king". The Daily Telegraph. UK. Retrieved 3 February 2007. ↑ Hart, Simon (4 February 2007). "Wilkinson makes dream return". The Daily Telegraph. UK. Retrieved 4 February 2007. ↑ "Hadden fumes over 'farcical' try". UK: BBC News. 3 February 2007. Retrieved 3 February 2007. ↑ Johnson, Ryan (10 February 2007). "Record-breaking Jonny kicks in for England". The Daily Telegraph. UK. Retrieved 10 February 2007. ↑ Hodges, Vicki (3 March 2007). "Catt to captain England as trio are ruled out". The Daily Telegraph. UK. Retrieved 6 March 2007. ↑ "London Irish 38–12 Newcastle". UK: BBC News. 3 March 2007. Retrieved 3 March 2007. ↑ "Tindall ruled out with broken leg". UK: BBC News. 14 April 2007. Retrieved 14 April 2007. ↑ "Robinson to captain England squad". London: BBC News. 1 May 2007. Retrieved 1 May 2007. ↑ "South Africa 58–10 England". UK: BBC News. 26 May 2007. Retrieved 26 May 2007. ↑ Cleary, Mick (4 June 2007). "Plucky England cling to positives amid debris". The Daily Telegraph. UK. Retrieved 4 June 2007. ↑ "England 62–5 Wales". UK: BBC News. 4 August 2007. Retrieved 4 August 2007. ↑ "Wilkinson hopeful of quick return". UK: BBC News. 6 September 2007. Retrieved 6 September 2007. ↑ "England face crisis at fly-half". UK: BBC News. 11 September 2007. Retrieved 11 September 2007. ↑ Hodgetts, Rob (22 September 2007). "Rugby World Cup". UK: BBC News. Retrieved 22 September 2007. ↑ Harlow, Phil (15 October 2007). "England v Australia as it happened". UK: BBC News. Retrieved 6 October 2007. ↑ Standley, James (13 October 2007). "England defy odds for World Cup final fling". UK: BBC News. Retrieved 13 October 2007. ↑ Cleary, Mick (15 October 2007). "England v France". The Daily Telegraph. UK. Retrieved 15 October 2007. ↑ Caroe, Charlie (17 March 2008). "Jonny Wilkinson: Danny Cipriani a joy to watch". The Daily Telegraph. London. Retrieved 17 March 2008. ↑ "Cipriani 'can improve Wilkinson'". UK: BBC News. 16 March 2008. Retrieved 16 March 2008. ↑ "Wilkinson set to the miss Six Nations". UK: BBC News. 10 October 2008. Retrieved 10 October 2008. ↑ "Falcons boss backs Wilkinson move". UK: BBC News. 20 May 2009. Retrieved 20 May 2009. ↑ "Wilkinson: The Comeback Kid". UK: BBC News. 4 February 2007. Retrieved 31 January 2007. ↑ "Wilkinson relief after comeback". UK: BBC News. 3 February 2007. Retrieved 3 February 2007. ↑ Hodgetts, Rob (14 March 2009). "O'Gara claims record". UK: BBC News. Retrieved 15 March 2009. ↑ Hodgetts, Rob (22 September 2007). "England 44-22 Samoa". BBC . Retrieved 25 January 2019. ↑ "Jonny Drops His Way to World Record". england-rugby.com. Archived from the original on 4 December 2008. Retrieved 25 February 2008. ↑ Caroe, Charlie (8 March 2008). "Jonny Wilkinson claims Test points record". The Daily Telegraph. UK. Retrieved 8 March 2008. ↑ Cleary, Mick (2 October 2008). "Jonny Wilkinson faces another lay-of". The Daily Telegraph. UK. Retrieved 2 October 2008. ↑ "Wilkinson agrees to join RC Toulonnais". London: BBC Sport. 18 May 2009. Retrieved 18 May 2009. ↑ "Cipriani demoted from elite squad". ESPN Scrum. 7 July 2009. Retrieved 8 July 2009. ↑ Cleary, Mick (30 September 2009). "Jonny Wilkinson back in a good place with England". The Daily Telegraph. UK. Retrieved 30 September 2009. ↑ "Toulon claim Heineken Cup glory". ESPN. 18 March 2013. Retrieved 20 May 2013. ↑ "Jonny Wilkinson announces retirement from all forms of rugby at the end of season". The Daily Telegraph. 19 May 2014. Retrieved 21 May 2014. ↑ Paul Rees (24 May 2014). "Jonny Wilkinson: 'I cannot say how proud I am to be a part of this'". The Observer. ↑ Jim White (31 May 2014). "Jonny Wilkinson bows out in style as Toulon beat Castres to claim Top 14 play-off final – a winner to the end..." The Daily Telegraph. ↑ "New Zealand humble South Africa". BBC News. 30 July 2011. ↑ "Jonny Wilkinson: 17 years of breaking rugby records". ITV News. 19 May 2014. Retrieved 13 June 2015. ↑ Cockerton, Paul; Blanchard, Jack (31 December 2014). "New Year's Honours: Jonny Wilkinson left embarrassed after missing out despite appearing to confirm knighthood". Daily Mirror. Retrieved 13 June 2015. ↑ "No. 61256". The London Gazette (Supplement). 13 June 2015. pp. B8–B10. ↑ Player Analysis: Jonny Wilkinson, ESPN Scrum, 14 March 2010. ↑ "Jonny Wilkinson". The Times. ↑ "Jonny Wilkinson: Lions & Falcons". Unofficial Falcon Rugby. 29 March 2003. ↑ Simon Hattenstone (23 October 2004). "'It's a kind of religion'". The Guardian. ↑ "How to Play Rugby My Way: by Jonny Wilkinson". Headline. ↑ Andy Bull (2 October 2008). "Don't write Jonny Wilkinson off just yet". The Guardian. ↑ Paul Rees (10 November 2011). "Jonny Wilkinson's autobiography reveals him to be a tortured soul". The Guardian. ↑ "Jonny Wilkinson invites his fans on a fresh tour of his tortured soul". The Sports Bookshelf. 8 November 2011. ↑ "Six Nations 2018 presenters: Martin Johnson, Jonny Wilkinson, Sam Warburton and Sir Clive Woodward top the bill as BBC and ITV wheel out all-star pundit teams". The Sun. 10 February 2018. Retrieved 25 March 2018. ↑ "Jonny Wilkinson interview". SkySports. Retrieved 25 March 2018. ↑ "England/ Players & Officials/ Mark Wilkinson". ESPN. Retrieved 6 May 2013. ↑ Wilkinson, Phil (14 July 2003). "SPORT ACADEMY PARENT: The Wilkinsons". BBC Sport. Retrieved 6 May 2013. ↑ "Teetotal Wilkinson nursed Cup hangover". Reuters. 22 October 2007. Retrieved 22 October 2007. ↑ Syed, Matthew (19 September 2008). "Jonny Wilkinson: The quantum leap that saved me from despair". The Times. UK. Retrieved 14 August 2009. ↑ Tyler, Richard (29 August 2011). "Jonny Wilkinson to launch clothes range Fineside". The Daily Telegraph. UK. Retrieved 16 September 2012. ↑ Allen, Peter (29 October 2013). "Rugby World Cup hero Jonny Wilkinson marries long-term girlfriend Shelley Jenkins". London Evening Standard . Retrieved 29 October 2013. Wikimedia Commons has media related to Jonny Wilkinson . [n1] Lewis Moody was substituted in the England vs Georgia match on 18 September 2011, and Simon Shaw was confirmed as captain for the remainder of the match.